I was in such 7th heaven to be in the stamp room again! This has been a long week and will continue being one into the next. I am working all weekend so this was a nice diversion. Keeps me sane though gets me unmotivated from getting my work done. I don't know about you but I could stamp all day all night and have more energy by the end than when I started. For some people, they get energized from exercise. For me, I get energized from creating. My card today was pretty fun to make. I used a stamp that I had never used before! I had a meeting with my boss this week and she gave me her very famous (and high delicious) homemade jam. This was so nice of her...she does this for all of us every Christmas and it truly is more delicious than anything you buy in the store. Such a treat to get it before Christmas! So I thought this was perfect for a thank you. I posted some closeups. I cut the jam out separately and propped it up with foam tape, tying a little twine around the top. I felt the lacy ribbon gave this a nice touch. I used the sketch from a very old sketch from Sketchbook Saturday (#11) and am entering the card into the Clearly iStamp ("Thank you") Challenge #6. Oh Margaret, this is so cute! 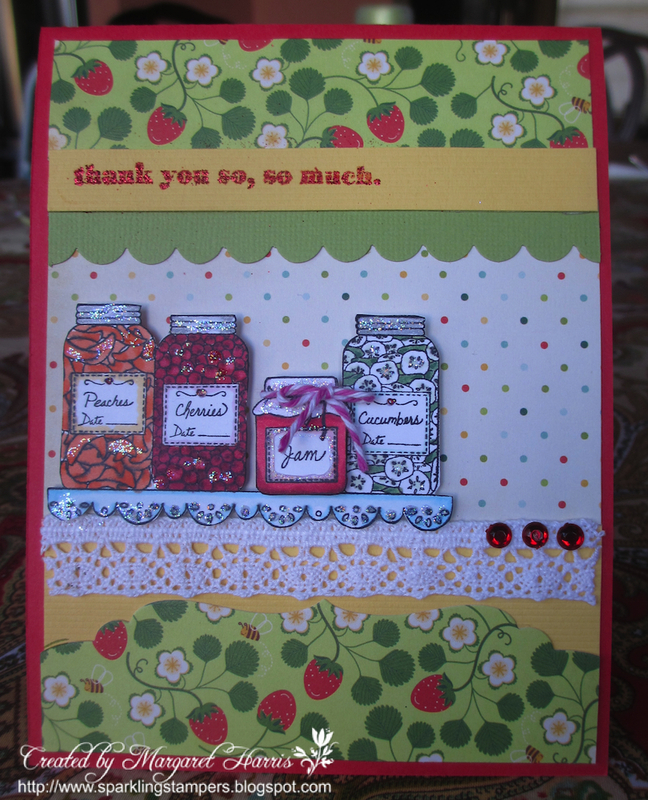 The card looks like an old timey kitchen! They way you popped up the jar of jam makes it so special!!! Brownie points coming your way!!! Oh you are right this is the perfect image for your boss! I love that you popped the jam out as it was pulled to the front of the shelf since that is what was given. Very clever. Just a wonderful card and she will love it. Thanks for playing in Clearly iStamp Blog Challenge #6 - Thank you. Oh these jars are so delightful! I just want to open them and sample! 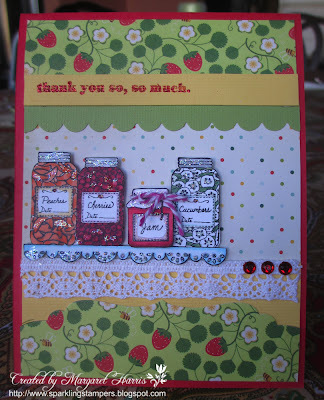 So glad you shared at Clearly iStamp! Those little jars are so adorable!! It must have taken ages to cut them all out, but they do look fabulous specially with the added dimension. Thanks for playing with Clearly iStamp.